Over here in the United States, the month of February is Black History Month. The month of February is also the shortest month of the year. As a result of both of these facts, the staff of Raggy Waltz decided to celebrate Black History Month by spotlighting jazz albums made by black artists. Beginning now. First up? An East Coast group playing West Coast-ish jazz, of course! Zur Musik! 1955: One year after the United States Supreme Court legally let my parents go to school with white kids. Ten years before my grandparents could legally vote in the U.S. Recorded just before the group appeared at the Newport Jazz Festival, this album was historic for multiple reasons. 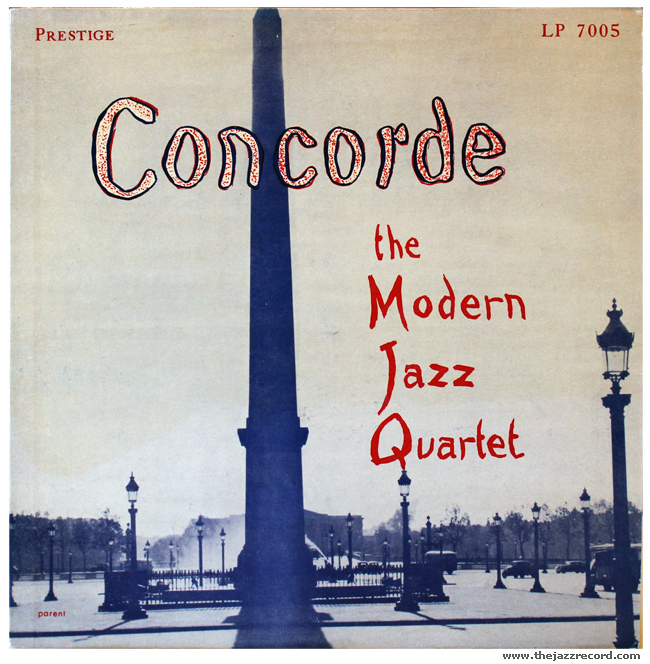 It marked Connie Kay’s first album with the Modern Jazz Quartet, replacing Kenny Clarke. 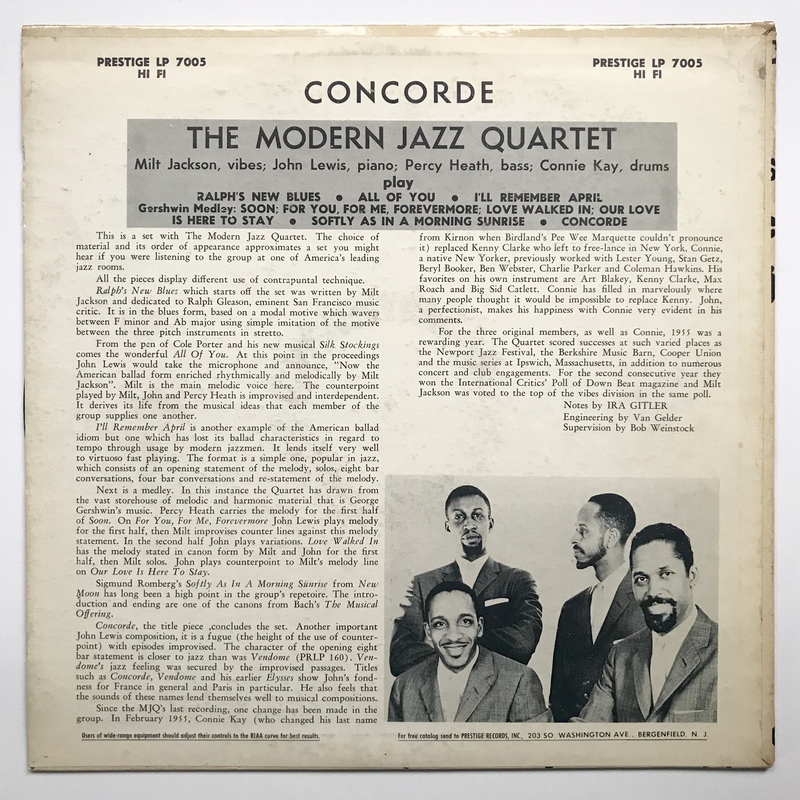 This album was also the MJQ’s first album recorded for the new 12-inch LP format. As a result, the guys stretch out and play in a casual, unpretentious manner. Picking a track to spotlight was a bit hard; I was going between the opening blues and “Softly As In A Morning Sunrise”. Both have a relaxed groove and excellent solos from all the guys in the group. I eventually settled on “Ralph’s New Blues” not just because of the tasty solos (especially John Lewis on this one) but the name. Written by Milt Jackson, the Ralph in the title is Ralph Gleason, San Francisco’s star jazz writer and critic. The West Coast connection deepens! Milt Jackson could solo endlessly on the blues and yet manage to sound fresh each time, and he does so here. After a number of choruses, Jackson yields the floor to the piano of Mr. Lewis. There’s a slight key change that adds some flavor and Lewis is off. Well, “off” as only John Lewis could go off. His always-tasty piano is downright delicious here. 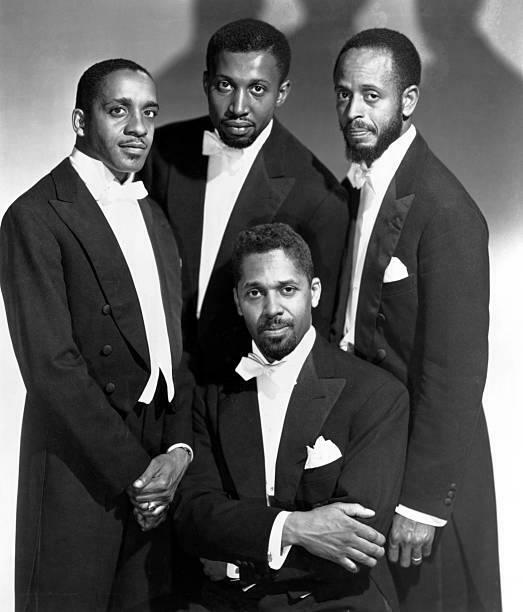 The Modern Jazz Quartet was famous for their unique brand of jazz that incorporated classical elements and combined them with jazz. This jazz fusion made them extremely popular during the 1950’s and even resulted in an award from the NAACP in 1957. They were among the first jazz groups to start playing concert halls in addition to the normal jazz club circuit. This and their penchant for wearing formal clothing during performances gave them an air of extreme importance, which of course they were. 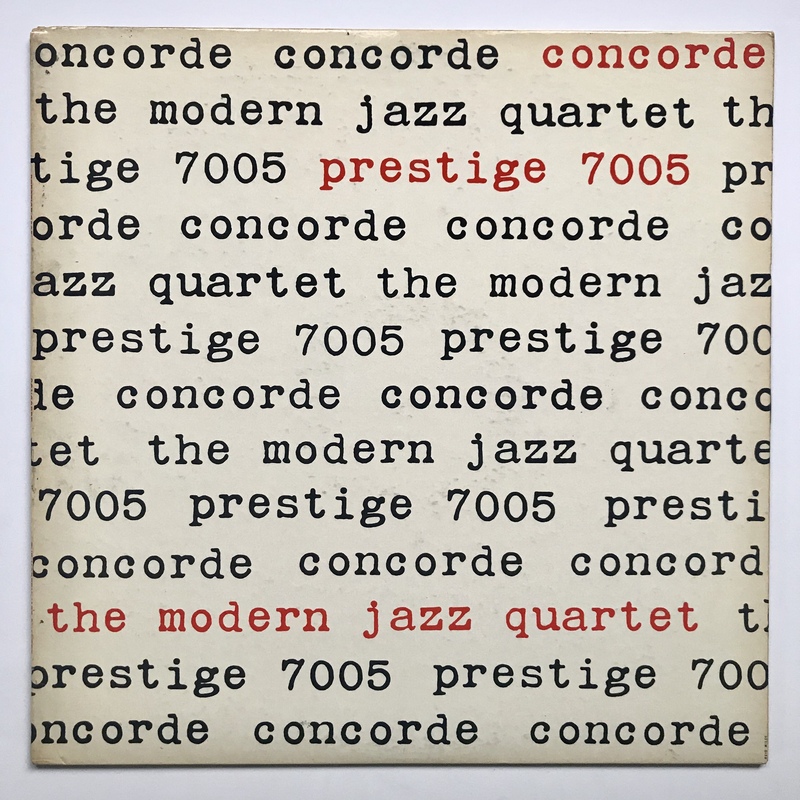 Three cheers for the Modern Jazz Quartet! In another example of non-art artwork, Reid Miles created a cover that at first seems bland and basic. Closer study reveals a rather hip, sophisticated design. The album title, catalog number, and band name are festooned across the album in black. Some of the words are not completely spelled out. Yet in the chaos, the use of red lettering points out the important info. The clean white background gives the artwork an aesthetically pleasing look, making for a perfect album cover for a record of clean music. Well done. I prefer the alternate cover to the original. What do you think? Rudy Van Gelder was behind the dials, so it still sounds good. My sentiments about RVG aside, I do like his sound. On this 1955 album, he was still settling into what would become his classic sound. The piano is nice and fuzzy (check), there’s space between the instruments (check), and the mono is punchy (check). Percy Heath’s bass is rather boomy and Connie Kay’s drums are somewhat lost in the mix, but overall the recording sounds great. The labels are yet another indication of the later provenance of this record. They sport the New Jersey labels, used by Prestige from 1958 thru 1964. The vinyl is severely deep-groove, which indicates the album was probably pressed in the late 50’s after the initial 1955 release. Interestingly, while “RVG” is hand-written on the second side, it’s stamped on the first side. During a summer trip back to the Motherland (Southern California), I stopped at the local record store, Redlands Vinyl. This being Southern California, the records were significantly more expensive than the records back in Huntsville, Alabama. Like, Erroll Garner records being sold for $15 bucks expensive. Accordingly, when I found this original-ish Prestige album, I was surprised to see it was only $19.99 (another bad sign at a record store-albums with sales tax). It was at the high end of my college collector budget, but I think it was worth it. Lewis sounds fantastic here. I prefer the alternate cover too. Even though so many of the Prestige LP covers from the late ’50s do not include the artists and at times are quite random and maybe could even be seen as meaningless, they still are so beautiful. I think the typography and design here are very aesthetically pleasing. Interesting about the RVG stamp on one side. Sounds like something went wrong at the pressing plant with the original master metal work for that side and Van Gelder had to recut it sometime after 1957. And I’m sure you know this but the Bergenfield address also places its pressing date after ’57. “Sounds like something went wrong at the pressing plant”. Ah, so that’s why one side is stamped and the other (original?) is handwritten. Any idea of what that “something” could be, and is that the usual reason why some albums have mixed stamped/handwritten RVG initials? If I’m not mistaken, a mastering engineer would need to remaster one side of an album for the pressing plant, not both, in the event that the “master metalwork” for one side broke or became unusable for some reason.